It was a price that seemed too good to be true. At her first Board of Estimates meeting as Baltimore’s mayor in 2016, Catherine Pugh was asked to approve a contract for installing covered water tanks at Druid Hill Park’s reservoir to comply with federal regulations. City engineers had estimated the project would cost $156 million. But in came a bid of just $134 million from a newcomer to Baltimore contracting circles. Oscar Renda Contracting of Roanoke, Texas, beat out its closest competitor, Allen Myers, by $10 million, in part by proposing a unique rip-rock cofferdam with a “turbidity curtain” to protect the reservoir’s drinking water. Recommended by the Department of Public Works (whose director, Rudy Chow, sits on the Board of Estimates), the contract was unanimously approved on December 7, 2016. Voting “yes” were the new mayor and her colleagues on the spending board, City Council President Bernard C. “Jack” Young, Comptroller Joan Pratt, acting Solicitor David Ralph and Chow. Eighteen months later, a project designed to safeguard the region’s drinking water has managed to jeopardize the purity of a key part of the water system. DPW director Chow has not publicly acknowledged the problems at the reservoir. State regulators who have documented the poor water quality at Druid Lake, say the water has not threatened the health of the 1.8 million residential and business users of Baltimore’s water system. But being forced to remove the reservoir from active use is a huge embarrassment to the Pugh administration and to DPW and raises concern about a major city infrastructure project scheduled to continue through 2022. Later today, a City Council hearing is scheduled on the “progress” of the Druid Lake project as well as the construction of water tanks at Hanlon Park near Lake Ashburton. • The reservoir has been out of service for the last six months because of high turbidity, a key measure of water quality. Reservoir drinking water is never supposed to test above 0.3 NTU (nephelometric turbidity units). But as early as last November, turbidity at Druid Lake exceeded 0.9 NTU, according the Maryland Department of the Environment (MDE). • High turbidity means water clouded with dissolved and suspended solids. The particles – often invisible to the naked eye – can carry viruses, parasites and bacteria that can cause nausea, cramps, diarrhea and headaches. They are also known to transmit gastrointestinal diseases. • MDE shut down the reservoir after repeated efforts to lower the turbidity level failed. After gyrating between 0.89 NTU and under 0.8 NTU in late November and December, Druid Lake was permanently taken out of service in January by MDE. The reservoir remains closed. 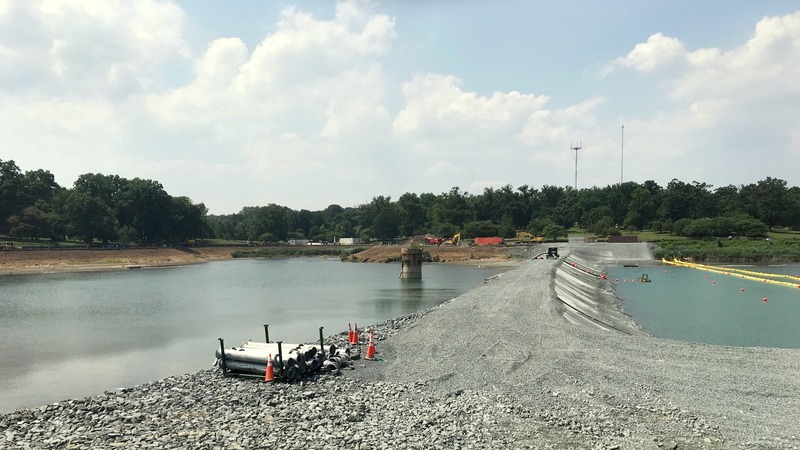 • With the cofferdam now completed by Oscar Renda, DPW has started draining off the contaminated water – most of it going into the Jones Falls – and introducing fresh water to try to return the lake to active use. In response to possible future episodes of turbidity, Pugh and Board of Estimates have also ordered emergency repairs at the Montebello Filtration Plant. In other words, if Druid Lake remains “dirty” and the filtration plant does not produce enough clean water to fill the gap, the metropolitan area faces a potential shortage of safe drinking water. Noted for its Victorian design and the wide walking path around its perimeter, Druid Lake has been a fixture at Druid Hill Park for nearly 150 years. When opened in 1873, the lake boasted the highest earthen dam in the United States. The dam was designed to hold back as much as 400 million gallons of finished drinking water. Protection of metropolitan water supplies became a major priority following the September 11 terrorist attack on the World Trade Center. In 2006, the Environmental Protection Agency issued the Long Term 2 Enhanced Surface Water Treatment Rule. The rule stipulated that drinking water reservoirs either must be treated with more chemicals than Baltimore was then using or must be covered. The Rawlings-Blake administration opted for the cover option. The original plan was to bury two concrete water storage tanks west of Druid Lake on park property. The Friends of Druid Hill Park and other groups objected to the location because it would shrink the park and disrupt the historic landscape. A location beneath the reservoir was then chosen. The contract won by Oscar Renda in 2016 called for two tanks to be installed under the west end of the lake, which would be split off from the main lake and drained. 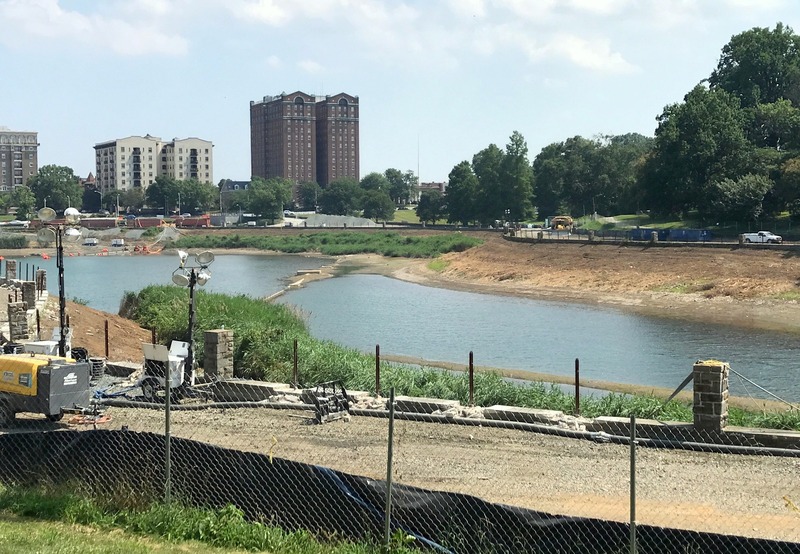 After the tanks were buried under the former reservoir, new green space would be created – and various other amenities have been promised by the Pugh administration. Key to the whole project was to proceed with the work while the reservoir was still in use storing and supplying drinking water to the city and surrounding counties. Oscar Renda proposed building a cofferdam, 900 feet in length and between 10 and 40 feet high, to hold back the reservoir water. The project would use 100,000 tons of riprap and surge stone for construction, a much cheaper method than the “sheet pile” cofferdams proposed by Allen Myers and Cianbro Corp., the losing bidders. 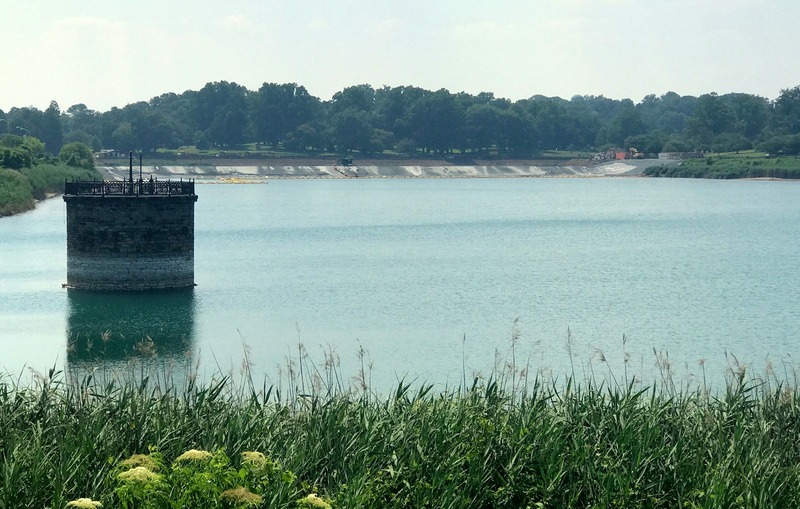 To forestall the possibility that the drinking water would be contaminated by the dust and sediment churned up by the riprap construction, Oscar Renda installed “double turbidity” plastic curtains across the lake. The curtains were supposed to hang down to bottom of the lake to keep out, secured with an oil boom around them. But something didn’t work. As the contractor transported up to 300 truckloads of rock a day to build the cofferdam, “the turbidity numbers in the lake were going off the chart,” an informed source told The Brew. A major question so far unanswered by DPW: Was the turbidity curtain installed properly? The source said the curtains – hung according to DPW’s specs of the lake’s depths – were too short and weren’t touching the bottom in some places, allowing the sediment stirred up the construction to seep into the drinking water. He did not address questions about the functioning of the turbidity curtain. On November 3, 2017, DPW stopped finished water from leaving the lake and flowing into the city’s water system. On November 20, “MDE and the City agreed to certain water quality parameters, including turbidity and bacteriological results, that would govern when the lake could be safety used,” according to MDE spokesman Jay Apperson. One criteria was if 0.6 NTU was found anywhere outside the turbidity curtain or if there was an increase by 0.1 NTU over a four-hour period, the contractor would stop work immediately. The lake was put back into service in late November, but was isolated again on December 6, when turbidity rose to 0.89 NTU. On December 18, the lake was put back in service, with all turbidity readings in the lake at or below 0.8 NTU, Apperson reported. But in early January, turbidity levels again exceeded 0.8 NTU and the lake was removed from service. The lake will remain out of service until NTU levels, as well as bacteria disinfection byproducts, are within acceptable levels, according to MDE water regulators Zoe Goodson and Neil Winner. “The city has instituted very safe, conservative triggers for reactivating the reservoir, and they let us oversee the process,” said Winner. 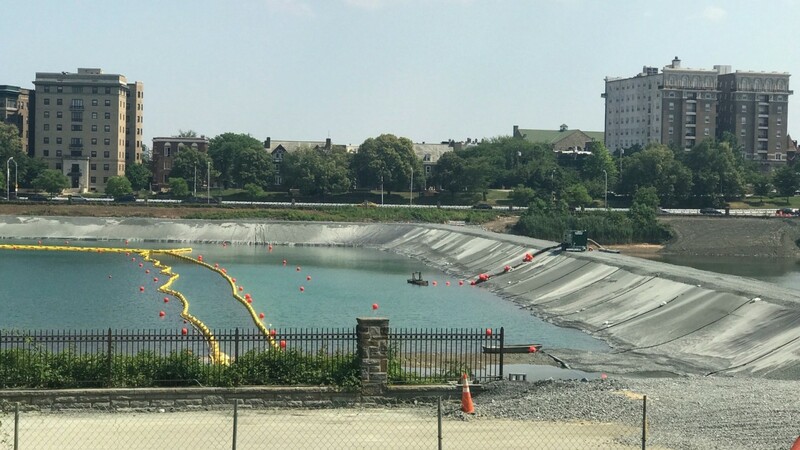 DPW spokesman Raymond said DPW is “now satisfied” with the cofferdam constructed by Oscar Renda and is in the process of draining the lake and refilling it with fresh water.